If you’re looking for inspiration to follow a dream in entertainment, your first stop is usually reading a success story from someone established, who is living the life you could only dream of. In this case, that dream involves riding shotgun in the new Kevin Hart comedy show, where the one and only Kevin Hart discovers budding stand up comics from coast to coast. We’ve told you about up-and-coming comedienne Alycia Cooper, who recently joined the world renowned Comedy Store Wall of Fame and have even taken you into the Writer’s Room and behind-the-scenes of Jimmy Kimmel Live. But it’s very rare that we get an opportunity to hear a raw, brutally honest account from a star on the cusp and still in the trenches, but steadily knocking down the door to Hollywood. 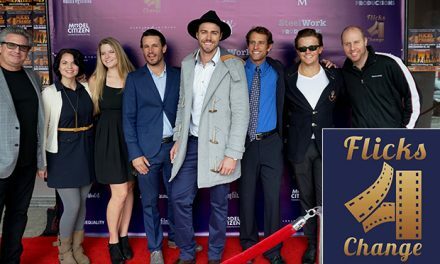 Anthony Moore is that rising star, with the door hinges flung free…all because he knew he had something to share with the world…this despite the support from friends but not always so much from industry insiders. Anthony persevered until, one day, Kevin Hart’s people came a knockin’. 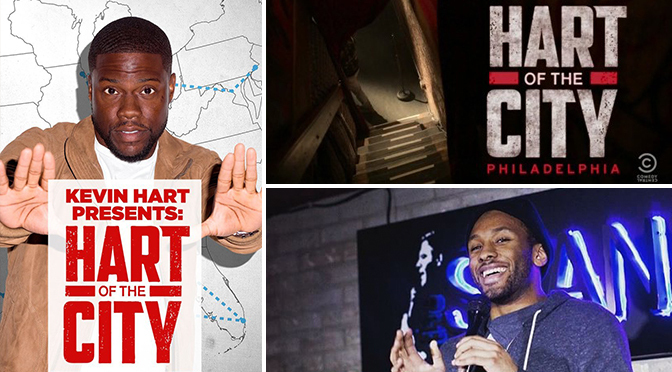 Anthony Moore has gone from an Accounting Major at Saint Joseph’s University to being featured on the Kevin Hart comedy show Hart of the City on Comedy Central. But the ride there has been anything but smooth. I met Anthony when the producers of the upcoming web series Wife of a Sneakerhead (Erick Henighan & Bryana Michelle) introduced me to him as the prospective lead. I had the pleasure of co-writing the series and was getting ready to direct. However, I was unfamiliar with Anthony at the time. I only knew that he was set to appear on the Kevin Hart comedy show. I checked out his stand up comedy and became an immediate fan and instantly knew that Anthony had a gift for gab and working a crowd. I talked with Erick and Bryana about limiting Anthony’s lines, which would allow Anthony to adlib more. Luckily, the producers agreed, and we were able to find a happy medium where he could be himself, but still deliver the necessary lines to push the boundaries of story, character and even breaking a few rules of comedy. Since his appearance on the Kevin Hart comedy show, Anthony has been a busy man, playing clubs up and down the East Coast. I had a chance to chat with him recently about his start in stand up comedy, our experience with creating the web series, getting advice from the Kevin Hart comedy show experience, and, oh, being on the brink of realizing a life-long dream. 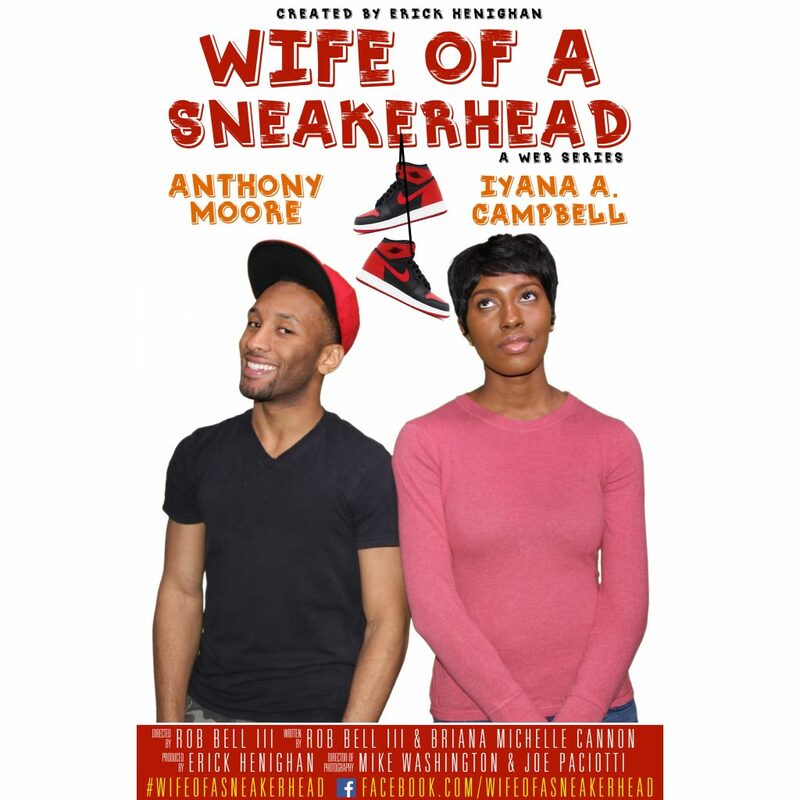 And in the coming weeks, I’ll give you an in-depth look at the making of the web series Wife of a Sneakerhead, but until then, here’s a preview of Anthony Moore’s talents and undeterred drive to succeed. RB: Who’s your favorite stand up comedian and how did they motivate you to pursue a career in entertainment that ultimately led to the Kevin Hart comedy show, Hart of the City? AM: Growing up, I would always watch stuff that my parents were into like The Jeffersons, and Good Times. 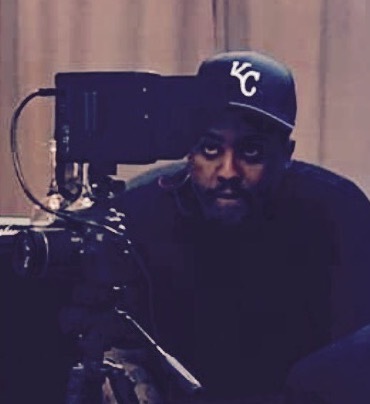 When I hit high school, that’s when I really got into the 90s shows like Martin….that’s when I said, “That’s what I want to do.” I wanted to have a TV show, and I didn’t know how to go about getting one, but I knew I wanted to do what Martin Lawrence did. RB: So you didn’t start out wanting to do stand up comedy? AM: No, I wanted to make people laugh, but I wanted to do it on TV. I never thought that I could get on stage and tell jokes. When I was in high school, I would make YouTube videos and put them out once a week of me just talking about my week or whatever. It was only stuff people in my school would get. At that time, I only knew how to make my friends laugh. I didn’t know how to reach a larger audience. RB: When did you know you wanted to be on stage? AM: I got into stand up comedy during my freshman year of college at Saint Joseph’s in Philadelphia. Twitter was just starting to take off, and my tweets were based around the trending topics. Suddenly people from around campus would start to tell me how funny they thought I was. During this time, my mind was set on trying to get that TV show, so my original focus was on how to get that done, and I thought of doing everything except stand up comedy. My second semester on campus, there was a talent show set up, and I was asked to host it. At first, I didn’t want to do it, because I didn’t think that I would be funny on stage. I only thought I was funny when I had conversations with my friends or on Twitter. Eventually, my friends got me to do it and when I got to the show I freestyled. I didn’t have anything written and I killed it. After that experience, I contacted a comedian I saw on BET’s Comic View named TuRae. He was the only other comedian other than Kevin Hart that I knew of. I told him that I needed help on becoming a comedian, and he told me to come down to The Laff House in Philadelphia for a workshop the following Wednesday. RB: Was there ever a time when you envisioned yourself in another profession? AM: Having my own TV show was always in the back of my mind, but I went to school to be an Accountant. My plan was very practical and that was to graduate, get a job at a good firm, and then start my own business in 20 years. After that talent show everything changed; my grades went completely down. Comedy is what I eventually spent all my time on. I would leave school, hop on the train to The Laff House and perform. By the time I got back to school, I was too tired to work, and a bunch of people were telling me how funny I was on stage, so I didn’t have the motivation for school anymore. At the end of that semester, I had three Cs and two Fs. Even though I ended up finishing school and getting my degree, my goal and plan going forward was to work on comedy full-time. RB: Can you tell us about your first time on stage? AM: My first time was at The Laff House in Philadelphia. I did pretty good my first time, because I took that workshop [at The Laff House] so I had a pretty good idea of how to put a joke together. Even though I made a lot of mistakes, [those] few months in comedy were actually pretty sweet. RB: Do you ever deal with self-doubt when it comes to getting on stage and performing? What was your worst experience? AM: To this day I still go through that and I ask myself “why am I doing this” because there are so many ups and downs in comedy. I remember my first bad show was at this club that used to be in Philly called The Blockley. A friend of mine asked me to perform at his event, and there were some YouTube stars who were supposed to be there so I thought it would be a packed crowd. When I got there, I noticed that there were no chairs! That was the first clue that I was being set up to fail. I went on stage around midnight and the said, “Ok, are ya’ll ready to hear a comedian,” and everybody just started booing. Something inside of me said to just go on stage and that night ended up being horrible. I had a lot of people I knew in the crowd, including my ex-girlfriend. On the car ride home I said to myself, “What am I doing?” After that, I couldn’t wait to get back on stage and redeem myself. RB: What helped you overcome that self-doubt? AM: I’m all in. I’ve made my life to the point now where I don’t have a plan B. After school I didn’t do any internships and I don’t have any experience in my field or anything, just a degree. I’ve moved to New York and pretty much have given everything up for this dream. I’m too deep in the game to turn back. RB: What’s your process for coming up with a stand up comedy routine? AM: If I have an idea based on something that I’ve lived through, I jot down the idea in my phone. It’s weird because I can’t tell myself to sit down and start writing, like on a schedule. When I try to do that, the first hour and a half I’m just staring at my books, listening to music, or looking up videos on YouTube. Once I do start writing, I take the idea from my notes and decide on which direction I want to take it in. I ask myself how I feel about the topic, think about the ups and downs, and I just keep digging until I find all the comedy I can in the topic. RB: You starred on the Philadelphia episode of the Kevin Hart comedy show Hart of the City on Comedy Central. How did you get selected to be on the show? I met him [Spank] outside The Laff House when I first started comedy. He told me to send him one of my videos because he wanted to put me in a showcase. At the time I had no idea what he was talking about. A week after I sent the video I got an email from a Comedy Central producer who told me they wanted to put me on a short list of comedians for a Kevin Hart show. It happened that simple and fast. RB: How did it feel to get that phone call to appear on Kevin Hart’s comedy show? AM: I was at work, so I was ready to walk out. I hated that job! Living in New York I had so many struggles in my life that led up to that point. I auditioned for a bunch of other shows like MTV’s Wild ‘n Out and Joking Off and never got any callbacks. I had meetings with Viacom execs who told me they thought I was funny but they couldn’t do anything with me because of the way I talked. They told me I needed to get speech classes. There were so many things people wanted to change about me. It got to the point where I didn’t even want a TV show anymore, I just wanted to focus on stand up comedy and being funny. I had faith that anything after that would eventually come. RB: With Kevin Hart being the biggest comedian in the industry, and you being from Philly like him, did you feel added pressure to make your own mark? AM: I did want to make my own mark. I wasn’t worried about the stand up comedy portion of the show at all. I knew I would do well. The part I was nervous about was sitting down and doing the interview with Kevin. It was my first time meeting him and being around him, and I was shaking and everything. I’m really not a star-struck person, but to meet somebody like Kevin was different. He told us that he knew we were nervous, because it was our first time being on TV, but he said he would make us look great. RB: Did Kevin give you any career advice? RB: What cities or clubs have the toughest crowds / rooms to win over? AM: I haven’t been to Atlanta but I hear down South is tough. Definitely, Philly for me though. Philly hates any type of gimmick; you have to be original. Philly can sense as soon as you’re doing something that’s not you. I feel like once you make it in Philly, you’re good anywhere else. RB: How do you pick your gigs? Do you perform at any club, or do you pick clubs based on crowds of your style? AM: Anywhere that has a stage, I’m trying to perform on it. I don’t care about the crowd. If they’re willing to listen, I’ll take my chance with them. When I started out in Philly, I knew the crowd was full of local people so I knew how to make them laugh. One club I performed at was in Time Square, and it’s not the best comedy club but it had a lot of tourists so I learned how to make people laugh from all over the world. You have to be diverse. RB: You’re the star of the upcoming web series Wife of a Sneakerhead, which I had the privilege of directing. That was your first time acting: what made you say “yes” to the script and in playing the lead role? AM: I knew the people behind the project were going to make sure everything was right. I knew you guys wouldn’t have asked me to do it if everything wasn’t put together right. I was looking to do something web based because when I meet with different managers and producers they always tell me that my stand up comedy is great, but they want to see my online content. RB: And was it difficult for you to stay “funny” while working from a script? AM: It was definitely a different experience, but a good experience to see how production worked, and how scenes were put together. RB: Can audiences expect to see more of you as “the actor” in the future after gaining more exposure from the Kevin Hart comedy series, Hart of the City? AM: Lately I’ve just been really focused on stand up comedy because I know that is going to be my foundation. I go back to an interview of TuRae that I watched when I first got into comedy. He said that all you have to do is focus on being funny and everything else will come to you, movies and everything. I do want to act, but right now I want to perfect my stand up comedy routine. RB: What is your ultimate goal? AM: To act and write my own show based on my life. I want to have Kevin Hart’s work ethic mixed with Dave Chappelle’s content. RB: What advice do you have to up-and-coming actors and stand up comedy artists? AM: I tell younger comedians at open mics… they’re going to have bad sets but try to forget it. People don’t realize that when you do bad, usually you’re the only one that remembers. People only remember the good sets, so don’t worry about taking your lumps on the “come up” because that’s what makes you better. There is beauty in the struggle and Anthony Moore’s story proves that. He’s not a superstar quite yet, but it is easy to envision that day coming soon for this talented comedian from Philly, who had the chance of a lifetime to have his work put on full display from one of his own comedic role models and mentors. Some would say that his ambition and willingness to go after his dream with no back up plan is success in and of itself, and I couldn’t agree more. So if you want to be a comedian, just remember, stay true to yourself, never accept “no” and “the funny” will put you on the right stage with the right people taking notice…and remembering your name.